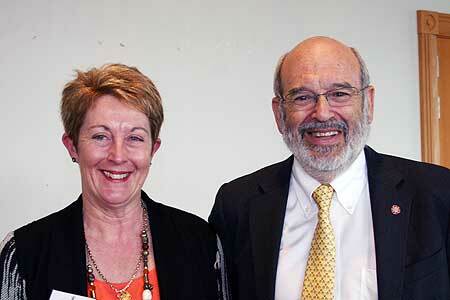 Dr Pamela von Hurst and Professor Sir Peter Gluckman at the Preventing Childhood Obesity Symposium held at Massey University. Professor Gluckman presented a keynote speech on his research into the ongoing effects poor nutrition can have on mother and child. He said the first step is to empower pregnant women with the right information on the best nutrition for them and their baby, and that more scientific research is needed in the developed world to fight this increasing trend. Professor Gluckman’s work with the International Society for Developmental Origins of Health and Disease (DOHaD) promotes shared knowledge between scientific groups working in different specialities and different countries and he is delighted this type of research collaboration is also being done in New Zealand. Symposium organiser and Institute of Food, Nutrition and Human Health lecturer Dr Pamela von Hurst agrees pregnant mothers need more information to give them and their babies the best possible start in life. Symposium topics ranged from practical healthy eating tips during pregnancy, to research on the use of supplements before and after pregnancy. Behavioural strategies for feeding infants and toddlers, and ways to prevent obesity in pre-school children were also discussed. The symposium provided an opportunity for health professionals and people working in the fields of nutrition, food and wellness to gain access to new research as part of their own professional development. The latest in a regular series of nutrition symposia hosted by Massey University, the aim is to translate nutrition research findings into practical, accessible information for use in the community. The Institute of Food, Nutrition and Human Health will form part of Massey’s new College of Health in 2013 that centres on illness and injury prevention, rather than cure. The college will bring together specialists in a range of disciplines to tackle New Zealand’s looming health crisis and through innovative research focus on what keeps people well and how to prevent illness and injury.